I know February is always short month, but it seemed to absolutely fly by this year! At New England Voices in Harmony, our fiscal year comes to an end in March, with a new year beginning in April. 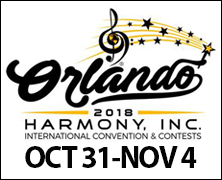 It’s a time for looking back on accomplishments, adjusting short- and long-term plans for the future, and considering how our own personal time and talents can be used this year to support and grow our mission of harmony. It’s also time to think about our annual awards. The Kathy Cox Memorial Award honors musical improvement, but also reflects the recipient’s positive influence within our organization. Kathy Cox was a member of New England Voices in Harmony who lost her courageous battle with cancer in December 2004. When she was growing up, she had been told repeatedly that she couldn’t sing. However, when she was convinced to try singing with us, she blossomed into an amazing member. She constantly worked on her music at home and always made improvements while maintaining a positive attitude. Kathy may not have been the strongest singer or the most skilled musician, but always brought her best and asked for help in order to do so. It’s a great reminder to us of the magic of ensemble singing! And the award is an important way to keep Kathy’s spirit and positive energy alive. She felt that we had changed her life for the better, and is a model of how we do that for each other. We also present a Barbershopper of the Year award, and every year it is extremely difficult to cast just one vote for the “right” recipient. As a non-profit volunteer organization, we all contribute time and talent in ways both large and small. 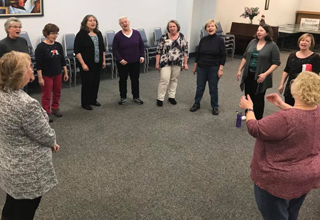 New England Voices in Harmony is full of members who go above and beyond the call of duty on a regular basis! It is fun every year just to read the nominations, especially when they reflect those who think they are providing quiet support behind the scenes, now called out into the spotlight. Although none of us do what we do to be recognized, it is a great thing to take the time at least once a year to recall these efforts, express our gratitude through the nomination process, and select the member who will be honored for her outstanding service. Please like and share this post. Every year I look forward to learning who is to receive each of these awards. Thanks for explaining the Kathy Cox Memorial Award in more detail than I had remembered. An inspiration to all of us! Can’t wait to see who the winner is!!! !